You may have heard of the names JPEG, GIF, BMP, PNG, and they are all actually different image formats. Each format has its own pros and cons so you will have to choose the correct image format to use depending on the situation. Unless you do a lot of image editing, you probably don’t need to understand what are the differences between different image formats. In computing, JPEG is a commonly used method of lossy compression (subtle areas of the picture are removed to reduce file size) for digital photography. You may have hundreds or even thousands of JPEG photos on our computer because most of the digital camera saves the captured photos in JPEG format because of the smaller file size. However there are times when JPEG photos can get corrupted or damaged due to many reasons such as a corrupt memory card, bad drive sectors, partial transfers, blue screens etc. One easy way you can scan for possible damaged JPEG images on your computer is by using a little program called Bad Peggy, created by Coder’s Lagoon, the same author who created TruPax. 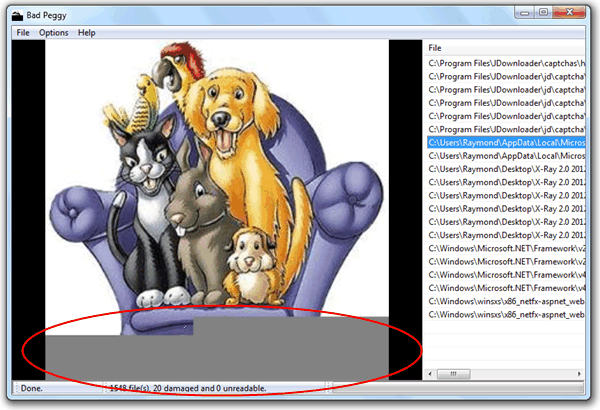 Bad Peggy is an easy to use program that can scan a defined folder together with subfolders for corrupted JPEG images. All you need to do is run Bad Peggy, there 2 built in languages (English and German) and you will be asked to select one on startup. When in the program click on the File menu and select Scan. Then browse the folder that you want to scan and click the OK button. Bad Peggy will instantly start scanning your hard drive to search for possibly damaged JPEG photos. I tried scanning some folders on my hard drive and it found a couple of damaged but still readable JPEG files. It can also tell if the JPEG is a truncated file because the file has not been fully downloaded. A couple of options available in the Bad Peggy menu are; running the program in low priority mode, use all CPU cores during the scan, include all sub folders in the scan and the option to add or remove specific file extensions the program will detect. Clicking on the result allows you to preview the found damaged JPEG file and you can move, delete or export the list by right clicking on the file list. Bad Peggy is free and portable that works on both Windows and Linux because it runs on Java. Running the setup or setup64 vbs file will install a shortcut icon on your desktop which tells your installed version of Java to run the files in the Bad Peggy folder. To remove Bad Peggy, simply delete the shortcut icon and delete the Bad Peggy folder. It works fine, for me, very useful software. Maybe it lacks of check mark boxes for an easiest multi selection mode although multiple selection works using keyboard keys. What exactly is the point of “knowing” that some picture are corrupted? This is a classical example of thinking inside the box. Think outside the box! Right now I’m trying to recover from friend’s pc. All that he cares and would be more than happy if can recover ar his personal family images. They were deleted few! monthes ago. Recovery software recover files but they have many alternatives of cluster size, indexes, crosslinks, aso, so how do you know if you acctualy recovered them? Well, you use this software. If 95% are broken you try other alternatives of recovery parameters. Think that there are thousands of files. I don’t think you would like to test them by hand, one by on, wouldn’t you?